Figure A33. 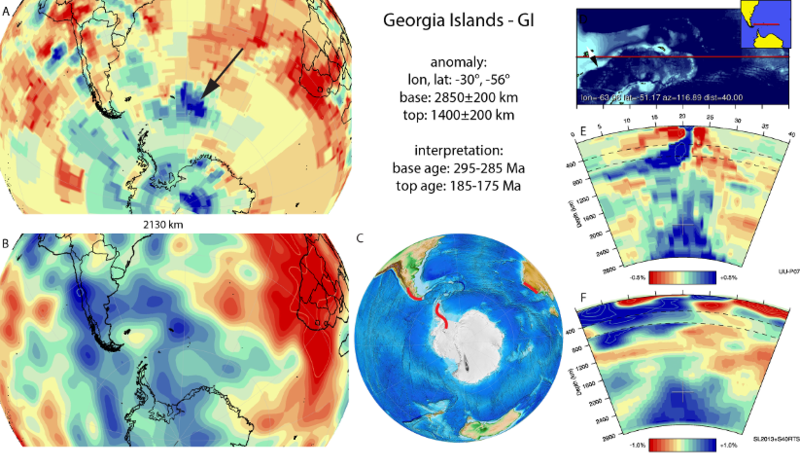 Georgia Islands anomaly, interpreted as the Georgia Islands slab, with (horizontal) [vertical] cross sections through (A)[D] the UUP07 p-wave) and (B)[D] the combined SL2013 and S40RTS s-wave models at 2130 km; C) the location of the modern geological record that we interpret to have formed during the subduction of the slab. is located below the southern Atlantic and Antarctic Oceans from the core-mantle boundary up into the mid-mantle, separated from the shallower Scotia slab (section 3.79). It is interpreted as a slab that appears to be flattened on the core-mantle boundary and has a W-E trend at shallower depths. It was first identified by van der Meer et al. (2010), who inferred an Early-Middle Mesozoic age of subduction. On trend with other deep slabs (i.e. Cocos and Brasilia that subducted below the Americas in the Mesozoic, the Georgia Islands slab probably subducted farther south along the southwestern Gondwana margin. The magmatic arc history of southern South America shows a gap in magmatism between the Early Triassic and the Jurassic, after which subduction re-initiated (Martin, 2007). The Jurassic and younger subduction history we associate with the more westerly located South Orkney Islands slab in the mid-mantle. Pre-Jurassic subduction in southern South America started at least in Carboniferous time (Pankhurst et al., 2006), although the anomaly that is still visible at the core-mantle boundary may represent lithosphere that subducted well thereafter at this trench. This subduction is associated with a continuous volcanic arc peaking in activity during the Late Permian (280-270 Ma) and remaining active until the Early Triassic (~245 Ma) (Pankhurst et al., 2006; Ramos, 2008). This episode of subduction culminated in the Gondwanide orogeny of the Triassic (~250-215 Ma), followed by regional extension (Pankhurst et al., 2006; Cawood and Buchan, 2007; Elliot and Fanning, 2008; Ramos, 2008; Tankard et al., 2009). The timing of slab detachment is highly uncertain, and may be inferred from the tectonic model of Dalziel et al. (2013) who interpreted the following sequence of events. Prior to 270 Ma a mantle plume impinged under the subducting slab, underplating it and causing the subducting slab to flatten. This induced the Gondwanide deformation and reduced arc volcanism during the 270–240 Ma period. Normal oceanic subduction and arc volcanism returned after the period of Gondwanide deformation. At approximately 200 Myr, a new mantle plume impinged beneath the subducted slab below Patagonia and southern Africa, eventually resulting in the Karoo-Ferrar Large Igneous Province at 182 Ma, and break-up and detachment of the Gondwana Island slab. We assume this 200-180 Ma age as the age of break-off, somewhat younger than in our previous interpretation of van der Meer et al. (2010).